DESCRIPTION: A luxurious getaway on 2 +/- wooded acres that is shared with a garage apartment, which can be rented in addition to the house for larger parties. 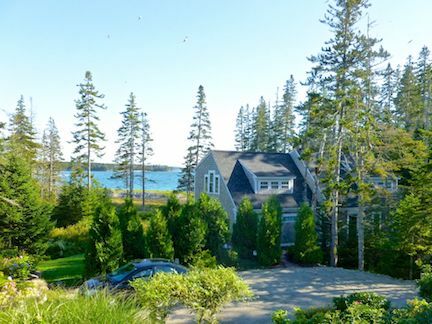 Cove House is situated just a short distance from the ocean, with wonderful water views. Wildlife galore are often spotted on the property with the nearby protected marshland. Explore the shore via a walking right of way to the ocean. 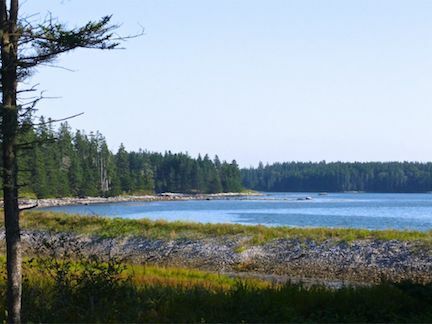 Conveniently located to all that Acadia National Park has to offer. Can be rented with Carriage House <sleeps 6> as well as Cove Cottage <sleeps 4>. LAYOUT: FIRST LEVEL: Living room, dining room, kitchen, tv room. Bedroom with a queen bed. Bedroom with a twin bed and a trundle bed. Full bath. 2 patios. SECOND LEVEL: Master bedroom with a queen bed and en suite bath with Jacuzzi style tub and separate shower as well as a deck with ocean view. Bedroom with a queen bed, deck with ocean view. Bedroom with 2 twin beds. Full bath. for additional guest up to 10. Owners live in detached apartment cottage on property.